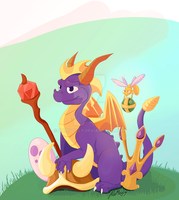 A stamp for fans of Spyro Reignited Trilogy, the remastered collection of the original Spyro games developed by Skylanders developer, Toys for Bob. Thank you for letting me use the Spyro stamp. "Thank you for releasing me!" -- Not just a quote from his first game, but his words to those who are making this upgrade! I'm guessing Toy For Bob stopped producing Skylanders just so they could bring the old Spyro back for the new generation.